Shirts With Random Triangles: Pig Howard Is An Ex-Tennessee Vol. The announcement of Howard's dismissal was given by Tennessee head coach Butch Jones during his press conference on Wednesday. "You try to impact every person that comes in your program," Jones said. "It’s all about choices and decisions. It’s unfortunate, but we have to continue to move forward." Howard was suspended for the first game of the 2015 season for a previous "violation of team rules." He has been recovering from a concussion, which had caused him to miss the two most recent games on the Tennessee schedule, which were both losses. 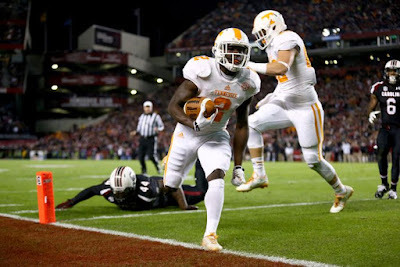 Tennessee faces Georgia this coming Saturday.